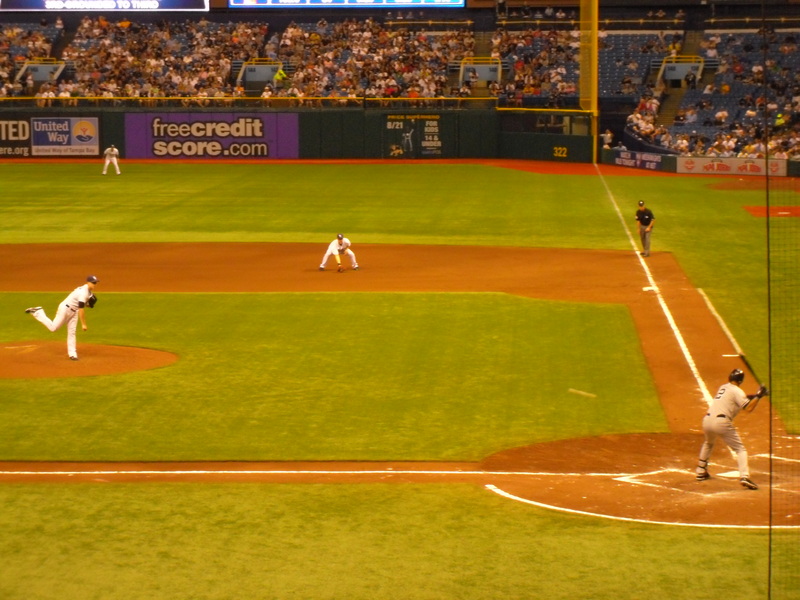 The Yankees are in town, so PoppaNut and I headed to Tropicana Field to get in on the action. One of PoppaNut’s clients gave us these amazing seats right behind home plate. We were so close that you could practically smell the sweat coming off each coachs’ foreheads. It was incredible. 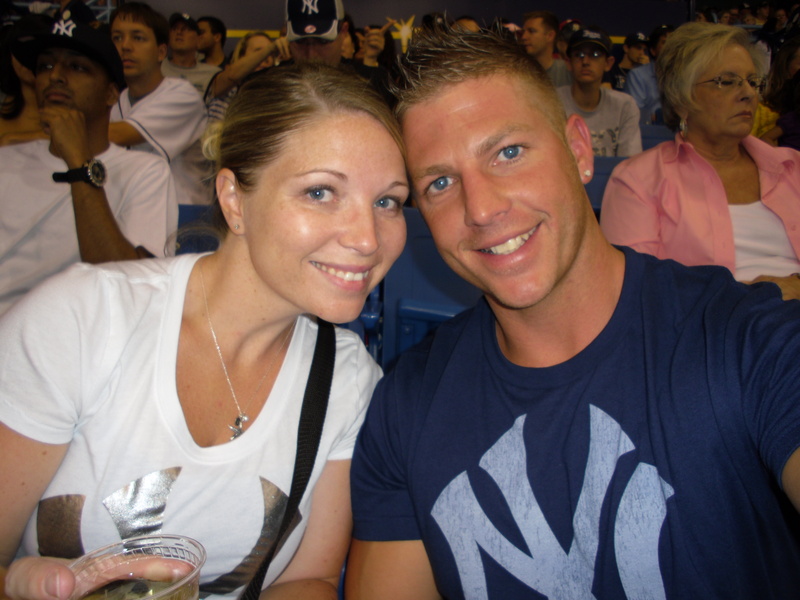 And yes, I was wearing my Victoria’s Secret Yankees shirt that I blogged about last week … and it was also incredible. But as we nestled into our front-and-center seats, it wasn’t the actual game that got my attention. In fact, the actual game has never been what draws me to the ball park. It’s the smells and the sounds that remind me of my childhood that keep me coming back for more. When I was little, my family used to drive up to Chicago to watch the Cubs (who would usually lose) play at Wrigley Field. I’m always telling PoppaNut about my love for Wrigley Field. Besides Disney, it’s the most magical place on Earth. 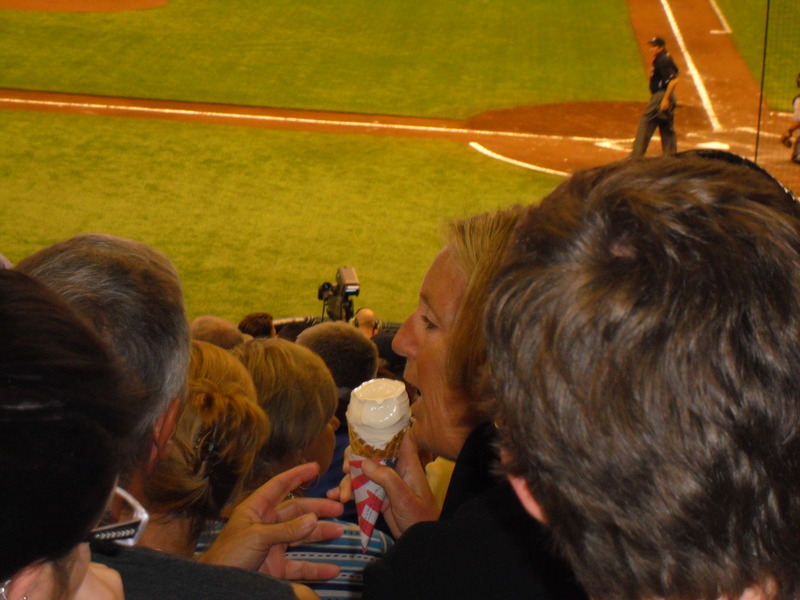 The history of Harry Caray singing “Take Me Out to the Ball Game” with a big ice-cream cone in my hand just can’t be beat. And my memories don’t hold any record … I can’t tell you how many games I went to when the Cubs won and how many games I went to when they lost … I just remember being with my family and having a great time. I have a special memory of heading to Wrigley Field with my Grandma Tam. Our whole family was there, and she wore a royal-blue bucket hat with a big Cubs logo on it. My Grandma Tam has since passed away, but I still have that hat tucked away in the Yankees room of all places. It’s dusty and a bit tattered, but that memory is still clear as day for me. My dad got very sick when I was in high school, and I remember when he started feeling better. He asked me to go with him to a Cubs game. I was suppose to work at the KOA Kampground (my summer job), but I couldn’t wait to call in sick, climb into the van and make my way up to Chicago. We didn’t have tickets, but we bought some at the gate … standing-room only. But once again, it didn’t matter. It was a special moment I’ll always cherish where a daughter got to enjoy the game with her wonderful dad! And PoppaNut and I have had some wonderful moments in the ball park. We have celebrated every one of his birthdays at a spring-training game. We have gone to Yankees games with friends and family … but my favorites are when it’s just us. We may be surrounded by tons of people, but it still feels like we are sharing such a special moment as just the two of us. And I saw those types of moments happening at the game last night. An older couple shared an ice-cream cone, a group of friends bonded over crazy calls, a dad explained the game to his son, a husband and wife shared a drink and took in the game. And that’s life in a nutshell … to me, it’s not the players who win … it’s the fans in the stand. Kerry woods pitching debut @ wrigley was the SRO game. quit making me cry.